Why did I decide to enroll in Superheroes? Because there's always more to learn, even though I've taught graphic novels and comic books and presented about using them in the classroom multiple times. Also: Stan Lee is one of the teachers. What am I most excited about learning about? The creative process behind the comic books. Rhetorical analysis and historical analysis and looking at comics as modern fairy tales, I've done. (Love thinking about how the theories of Jack Zipes apply to the changes in the big name heroes.) I'm trying to push myself to be more creative, too, so this fits perfectly. What am I hoping to achieve in the course? I'm coming into this class with limited expectations. Learning? Growing? Fun? I am really just taking this class for poops and giggles, even though it will likely look nice on my CV. Who is my favorite superhero? Why? GAH! How can one pick? My favorite comic book character isn't a superhero in the traditional sense. Usagi Yojimbo is my boy, but that's no surprise. I adore samurai films (especially Kurosawa) but I'm also a sucker for fierce animals. For a more traditional "superhero" pick, it's probably Hellboy. Sure, he's a demon, but he's always seemed more "real" to me than so many others. Also, Mike Mignola's art style resonates with me. There's a newer character of whom I'm fond but I don't know her as well yet: Zephyr (Faith Herbert). It's an oft heard refrain, but representation really matters. Seeing a rad fatty flying? Awesome. Who are my all-time top 5 favorite superheroes? What is my favorite comic for each? Batman in "Library of Souls." I'm a librarian, so anything library-esque catches my attention. And in this book, Batman has one of the most groaningly awful good lines I've ever seen: "He pulled out a Saturday Night Special. Too bad it was Friday night." 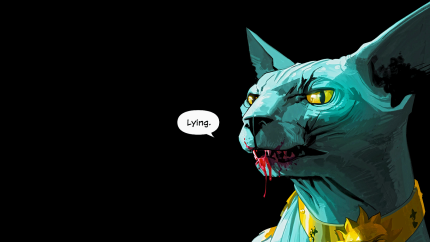 Any of the animal cyborgs in WE3 by Grant Morrison, but the bunny most of all. Using animals to show us our own mortality is brilliant, and the rabbit was perhaps the bravest of the group. Superman in The Wake by Neil Gaiman. That cracked, although not broken, fourth wall moment when he and Batman talk about nightmares where they are really actors playing themselves in a television show...? That moment has always stuck with me, and creative moments that stick feel like Art instead of art. Death at any point in "The Sandman" series, but especially in The Kindly Ones when she comes to take her brother. Her kind but absolute honesty is so different from all of her siblings, and her ability to find joy in her life is inspiring. And I know I promised to stick to traditional superheroes, but I can't not mention one of my newest favorite characters: Lying Cat. She may only be a supporting character in the plot of "Saga," but she feels to me like the voice of the series. Who are some of my favorite authors and illustrators? Evan Dorkin, for sure. LOVE Beasts of Burden. Bryan Talbot, too. His storytelling ability slays me. Scott McCloud. His ability to teach by demonstrating in his works is amazing. Fabio Moon and Gabriel Ba - I am always happy when I read their books. I don't even care what the story lines are, I know I'm going to love it. Gene Luen Yang (I don't remember this, but I've been told I squeaked when I met him in person). He's another artist/author with amazing storytelling skills. Jill Thompson... I was introduced to her drawing style in "The Sandman" series and try to follow her wherever she goes. Ursula Vernon. I wish I could live inside her art sometimes - so beautifully surreal. I could go on and on and on. How do I engage with other comic fans in your local community and/or online? I mostly don't engage in the local community, but I do go to the tiny comic con they have in my city every year. This year I'll even be presenting! On a panel with an English professor (at the college where I work) and an English teacher (at a local high school) about integrating comics into the curriculum. Online, I chat with friends and follow my favorite publishers (Dark Horse, Fantagraphics, Image) on Twitter so I can keep up with what's new.